Single-plane, high-rise intakes designed to produce maximum power at higher rpm. 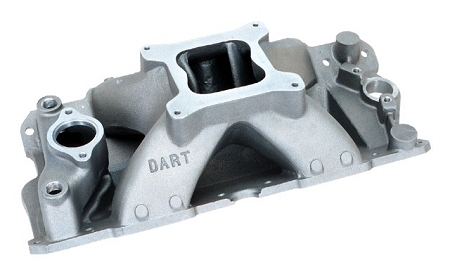 Dart single plane small block manifolds are designed for standard port location 23 degree cylinder heads. Carburetor pads are specifically designed for 4150 & 4500 carbs. Extended runner dividers equalize port length and are radiused to equalize cylinder-to cylinder fuel distribution. Optimized runner cross-sectional area maintains high mixture velocity for maximum torque. Angled runners turn the airfuel mixture smoothly from carburetor to ports. Dual distributor hold-downs simplify timing adjustments. Manifold flanges are scalloped to clear center water outlets, and bosses for rear coolant lines are provided. Raised water cross-over and air gap insulate the intake charge from engine heat. Integral bosses for nitrous injectors.